Thou shalt comfort me on EVERY side. We live in a world of trials, troubles, temptations and tribulations. We have been born in a season of sin and sorrow, for we were born in Adam. Some of life’s problems and pain result from our own self-imposed sins – from our own sins, shortcomings, foolishness or neglect. Some result from the consequences of outside circumstances or the carelessness of others – but like as a father pities his own children, or a mother yearns for her offspring, so the Lord Himself has deep compassion on those that fear Him – and He supplies in all circumstances and situations, for He is our dear, heavenly Comforter. To be comforted in my own self-imposed sins and stupidity, I must confess my fault. He has given us the formula in 1John 1:9 and Hebrews 12:2. Confess all sins and shortcomings, and turn away from them, and look to Him. Once confessed – even the gravest of sins, in thought, word or deed, have been cleansed – and as far as east is from west – thus far has He removed our sins – forever. Do you sometimes revisit those sins committed in the flush of youth? Do you bow your head in shame thinking that your sins were too grave to be forgiven? Do you strive; in your own way, to prove yourself to now be good enough? You foolish man – you silly woman, accept His forgiveness and be comforted. You pride yourself, that the depth of your faults exceeds the height of His Grace. Your sins, like grains of sand, are washed in the vast ocean of His loving absolution. Then there are those sorrows brought to bear from a myriad of external sources. Others, who have consciously or unconsciously grieved our heart to distraction… as day by day we are bombarded with pain and distress BY others – as day by day we are bombarded with the pain and distress OF others. Injuries from other people are all soothed with the comforting balm of the Lord. Empathy for another is discovered from our Heavenly Comforter’s arms, for His forgiveness and consolation, flows out from Him, through you – to others. What of that noblest of all sufferering? What if men revile and persecute you? What if others speak evil of you falsely, for His sake? You have a reward in time and in eternity. You will reign with Him in His kingdom in time (ruling with a rod of iron) but you will also be with Him for eternity (as an example in the ages to come of His astonishing grace.) Whatever the cause of your earthly sorrow – healing and peace comes from Him. 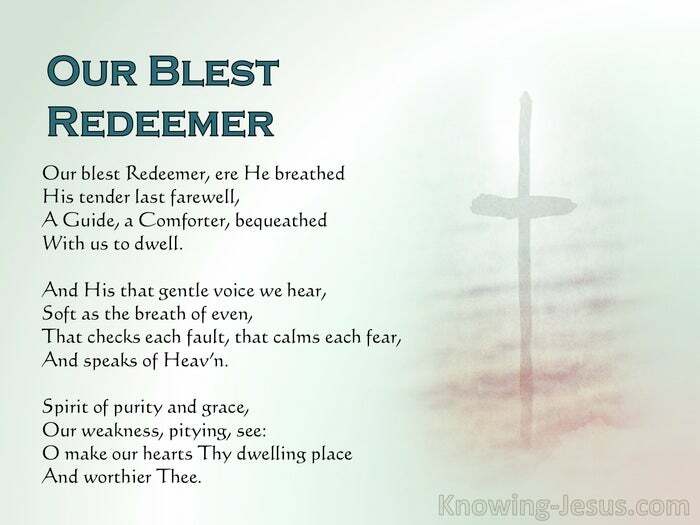 No matter what causes your distress of soul – blessings and renewal come from the Lord, Who in time and in eternity is the Comforter of your soul. In this world system even God’s best servants can become subject to depression. Some suffer exhaustion or emotional pain; rejections; isolation; desertions. Some are overworked; physically weak; beset by problems; plagued with grief, yet we learn deep lessons from His dealings with His servants in days gone by – He intimately knows each and every one of His own, over-wrought ministers. He dealt tenderly and compassionately with every Elijah and each Jeremiah. He showed sweet gentleness of heart to every Mary and each Hannah… and He is no respecter of persons. He will do the same for you, and He will do the same for me too. God knows each of us by name and will never place too heavy a burden upon us. Let us commit, daily, to resting in Him through the trial of human experience. Let us, in confidence, abide continually in His heavenly comfort, and receive blessing and renewal from our precious heavenly Comforter. 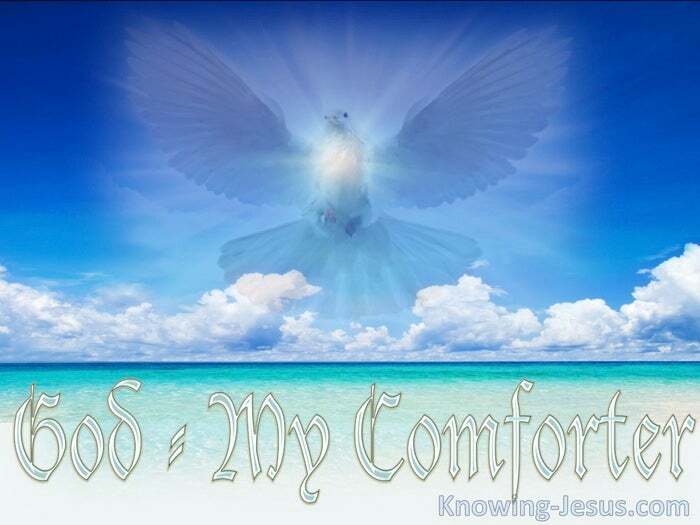 He our indwelling Comforter gives Spirit to spirit comfort and rest. He will never leave you, He will never forsake you – in time or throughout eternity.